Brand New modular combination kitchen and Laundry, NZ made. Ideal for Studio, apartment and sleep-out. Everything is inside of this small kitchen which is more convinient. Carcases made by 16mm Bestwood Gloss White HMR Melamine, Front door/drawer and end panel can be chosen 16mm thick melamine from Melteca, Bestwood Melamine and Prime Melamine, 30mm thick Formica bench top, bench top with bull nose front, clashed both end edges. S/S one bowl sink inserted. 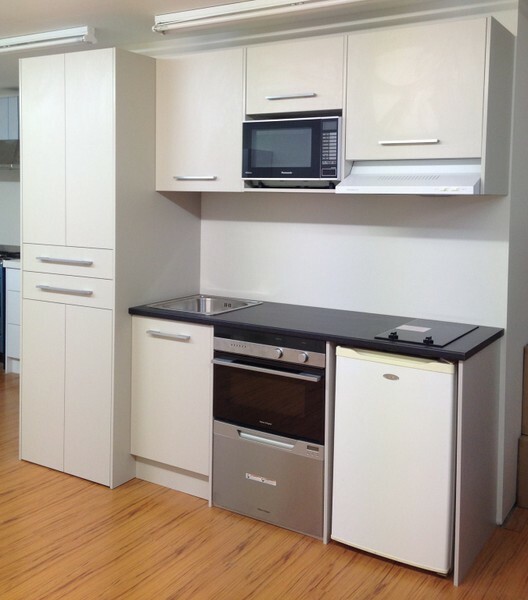 Cabinet doors/drawers with 2mm PVC edge tap and slim square handles, cabinets fully assembled. Base cabinets: 870 high, 580 deep Tall cabinets: 700 deep, 2200 high. It comes with 1 x 1200 toekicks, 3 base end panels (870x580), 1 wall end panels (700x400) and 2 tall end panel (2200x700).Electric ceramic hob with 2 burner included, all other appliances excluded.